You’ve invested a lot of time and money into choosing the best tools for your projects. They deserve a great place to rest in between the times you need them. How about treating your tools by getting one of these handsome storage options? These are the best tool chests under $500. After all, you need a place to store your favorite gadgets and gizmos that you need to get your jobs done right and keep them both handy and protected for many years to come. This handsome, sturdy, and durable Keter 5-Drawer Modular Tool Chest is quite the workhouse addition to your workshop. There’s plenty of storage, durable wheels for mobility, and you can detach the top from the bottom to move it where you need it to go. There’s a lot to like about this Keter 5-Drawer Modular Tool Chest (Amazon link). It’s meant for heavy-duty and long-lasting storage, so it will protect your tools and equipment in garages, basements, utility rooms, and workshops. It’s made out of durable polypropylene which has been strengthened with resin. This is heavier than regular plastic and also helps protect the tool chest. Even if it gets wet, your tools are protected. Speaking of protection, there’s also a central locking system so that each drawer stays secure. The bottom drawer is the deepest for extra storage, while 16 removable smart part bins and dividers are included to create separate smaller compartments. You can wheel it on the four included steady casters, or detach the top and move it elsewhere. It has handles that lock into place. This tool chest measures 22.1″ L x 11.3″ W x 23.5″ H with the wheels on and 22.1″ L x 11.3″ W x 19.8″ H without the wheels on. It weighs 25.5 lbs. empty. With all these features, it also has negatives. While it is made of plastic, it doesn’t have the strength and durability that metal tool chests have. It will protect your tools but it’s not fully waterproof. Also, this tool chest is a bit on the small side, so it’s only good sized for hand tools, not larger power tools, and drills. But, for those who have these needs, it’s one of the best tool chests under $1000. Of course, we had to include at least one classic in our quest for the best tool chest under $500. When you hear the Craftsman name, it still means quality after all these years. That’s the same for this exceptionally heavy duty and well-designed 3-Drawer Metal Tool Chest (Amazon link). You’re buying a piece of equipment that’s built to last and will store your tools for decades. Many buyers are looking to not just replace an existing Craftsman tool chest they already own, but add another to their collection. This box is ideal for either buyer. It comes in cherry red, with a black handle and metal hardware accents. There are three drawers included, and the whole tool chest is made of metal. Open the lid, and there is a nice large compartment for easy access storage. The three drawers are wide but thin, so you can see everything. They glide out easily and close easily, too. When you close the lid, the drawers lock automatically for safety and convenience. Two large metal latches hold the lid firmly in place. This tool chest measures 23″ W x 14″ H x 11″ D, with a shipping weight of 19 lbs. It’s heavy even when it’s not filled! Even with a Craftsman, there are negatives. It is made in Asia, not the USA. Also, there are no wheels, and it is very heavy. So make sure that the first spot you put it is the last! The drawers are shallow, not even 3″ deep, so it won’t fit larger tools or power tools. This is a strong, solid metal box that would be an excellent smaller tool chest in addition to someone’s collection. A handsome wooden exterior, soft and well applied green felted interior and shiny nickel hardware are just some of the great details you’ll find on this Trinity Wood Toolbox (Amazon link). 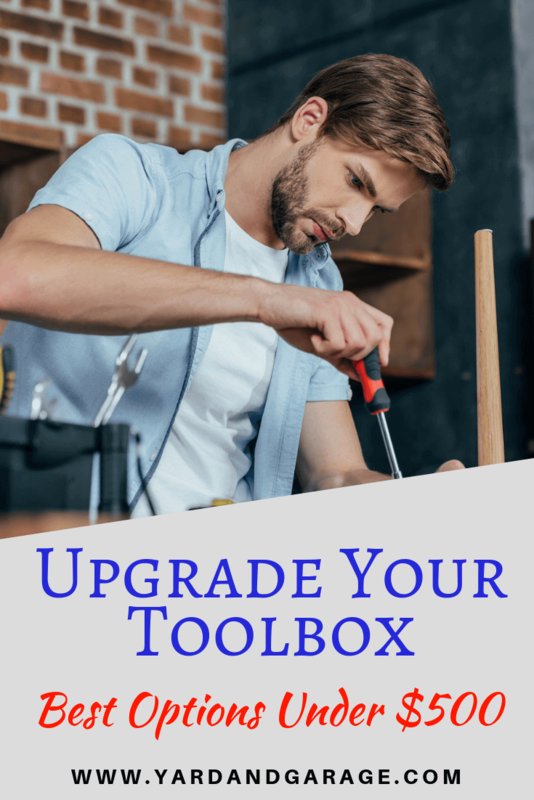 It’s a nice, high-end box that could serve a multitude of uses, including for tools, jewelry, small parts, or even toys. The cherry wood look sets this Trinity TWM-3501 Wood Tool Chest apart. It resembles an antique tea chest with all of its little compartments, including 8 drawers for plenty of storage. You’ll have fun organizing with so many drawers. The drawers are concealed by a front lid, which pulls out from underneath the tool chest and lifts up to latch to the top lid. The box is accented with nickel plated side handles, drawer knobs, corners, and other hardware. Each drawer, plus the lid, is lined with a soft green felt that’s well applied and doesn’t bunch or bubble. Your tools, jewels, and other precious items will be well protected. At the bottom, there are round silicone feet on each of the four corners that will protect this chest from scratching surfaces or getting scratched itself. As for size, this tool chest measures 20.75″ W x 10.5″ D x 13.75″ H, with an empty weight of about 25 lbs., so it’s solid and heavy for years of proper use. There are some negatives, even with this handsome wood tool chest. It’s made of MDF (manufactured density fiberboard), so it’s not real wood. As such, it’s not durable and won’t last for years and years like real wood, such as actual cherry, oak, or walnut. This box is not meant to be stored in garages or basements where the MDF would crack, warp, or split. It doesn’t have any wheels or casters and can be heavy when filled, so it should be placed in a location where it won’t be frequently moved. It’s best for tool owners looking for an attractive box to keep in a temperature-controlled room. Stalwart has created a really interesting, mobile, and modular oversized portable tool chest (Amazon link) with this striking model. There are three toolboxes in one, it has wheels for portability, and there’s plenty of storage in the three deep drawers. The Trademark Tools Oversized Portable Tool Chest is large and stable. After you wheel it to the spot you need, you can easily stand it upright and it won’t tip over. Each of the three drawers separates into distinct toolboxes. The bottom drawer is more like a bin that tilts out and is connected to the rear wheels. You assemble the smaller two drawers on top, and they lock into place. There’s an adjustable carrying handle in the back, very similar to a rolling suitcase. The top box measures 19.5″ x 9″ x 7″, the middle box measures 19.5″ x 9″ x 9″, and the bottom box measures 19″ x 9″ x 13″. In size, when fully assembled, this tool chest measures 28″ H x 19.5″ W x 11.5″ D, with an empty weight of 25 lbs. We also find some negatives, even with this large and expansive tool chest. It is not attractively designed, so this is much more utilitarian than one made out of wood. It’s best for a garage, basement, or utility room where the function is more important than aesthetics. It’s also made of plastic, which isn’t as durable as metal. This is not the heavier duty polypropylene plastic, but more like the type of plastic used for lidded tubs. It’s not weatherproof. You can’t wheel this tool chest up and down stairs due to the wheel design. It has to be physically lifted. In all, however, we appreciate the clever design, ample storage, and mobility of this tool chest. When you think workshop tool chest, the Handyman Heavy Duty Steel Toolbox (Amazon link) with Chests and Roller Cabinets is what comes to mind. It has seven drawers, two trays and a large cabinet throughout its double level design. It has four omnidirectional wheels, a side handle, and is manufactured in a striking solid red color. You’ll enjoy all the storage in this Handyman Heavy Duty Steel Toolbox with Chests and Roller Cabinets 4 Wheel Casters Chest. It has three large drawers, three small drawers and one large box drawer that are lined with an absorbent material that can soak up excess oil or other liquids. The drawers are kept locked and in place with a top lock and key giving you extra security and peace of mind that your contents are secure. The body of the storage tool chest is made out of heavy duty steel and is resistant to scratches, corrosion, and light weather. On the bottom of the tool chest are four sturdy swivel casters of which two have locking capabilities. You can wheel it anywhere to set it up in the location of your choosing. The size of this tool chest is 24″ W x 13″ D x 43″ H, with a fairly heavy weight of 57 lbs. when empty. 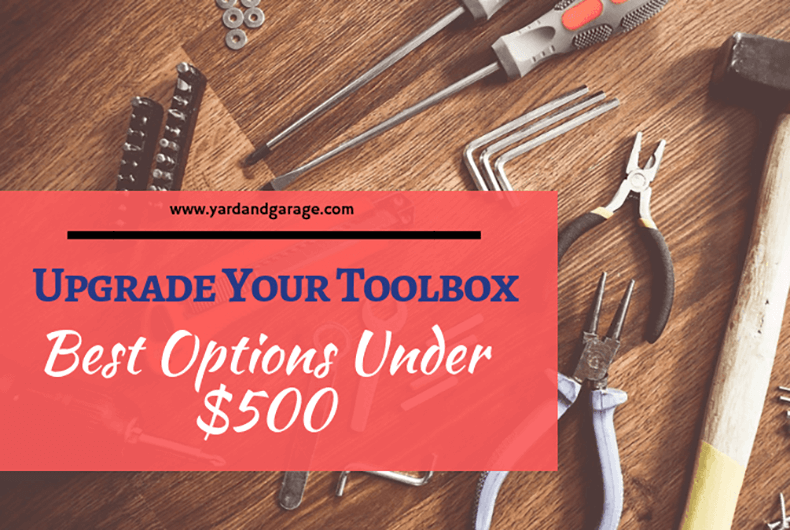 This is a great tool chest, but it also has some cons for buyers to be aware of. The assembly is somewhat difficult for most people and the steel construction is not durable enough to withstand industrial use. We’d recommend this tool chest for those who need normal household tool storage on wheels. We hope you’re as pleased with this excellent selection of tool chests under $500 as we were. You get a variety of brands, design styles, materials, and storage capacities. We’ve compared all these features, and come up with a clear winner as the best tool chest for the money: the Craftsman 3-Drawer Metal Portable Tool Chest. Despite it being heavy with no wheels for mobility, you can’t overlook the durability, deep drawers, and long-lasting metal construction. It’s also designed well, with the traditional red color and sturdy black drawers. This Craftsman tool chest has plenty of storage and will quickly become one of your favorite storage options in the garage, basement, or workshop. It’s the clear winner!